I’m back! I know- it’s been absolutely forever since I last blogged and I promise (if anyone is still reading this!) that I won’t take such long blogging breaks anymore. 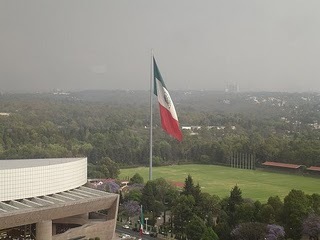 Life, work, Scrabulous and other things have gotten in the way of Tuna Toast but I am happy to be back and even happier to report about my recent trip to Mexico City. 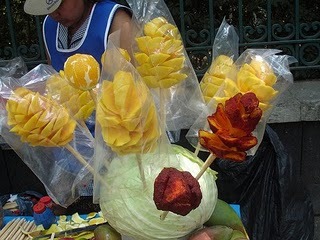 I went for just a few days last week to meet up with J, and saw and tasted so many gorgeous things that I think I’ll have to break my Mexico City posts into several. 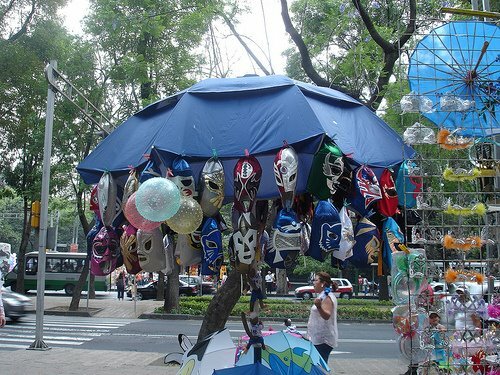 First of all, I love Mexico City. It’s such a vibrant city with so many smells, colors and flavors and is definitely what I like to dub a “real big city.” To me, Paris, Tokyo and New York also fall into that category- and Los Angeles, the one I actually live in- does not. Sure LA is technically a big city but with a lame mass transit system that few people use, the inability of residents to get anywhere without a car and restaurants closing their doors at around 11:00 PM, it just doesn’t have the energy or convenience of the other cities I mentioned. 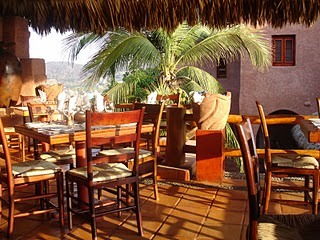 Having planned my trip in advance, I’d made reservations at Izote de Patricia Quintana for our first night in the city. I’d read a lot about this restaurant whose chef has helped put Mexico City on the gourmet map by drawing heavily on indigenous ingredients and was very excited to try it. 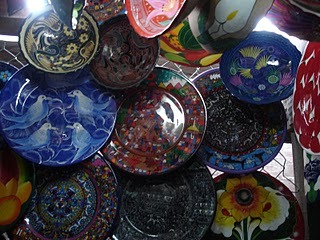 The restaurant was very colorful and was filled with fashionable men and women- it is located in Polcano, which many call the “Beverly Hills” of Mexico City. We ordered drinks (tequila for my friend, a dark beer for J, margarita for me and “Coke Light” for my friend LS who doesn’t drink) and looked over the English menu. There were so many interesting options that it was difficult to make a choice, but after consulting each other on what we were getting (to make sure there were no duplicates!) we ordered our food. 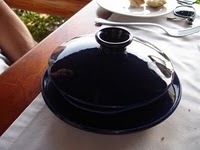 We were given a basket of large, crispy tortillas made with blue corn and a trio of salsas. 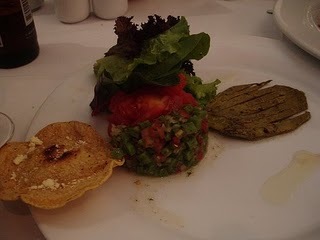 All were very tasty, with the salsa verde being everyone’s favorite. 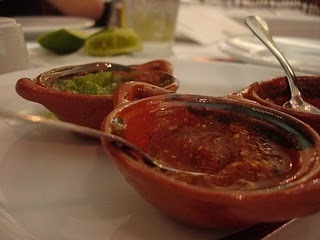 They were the perfect accompaniment to our drinks- my margarita was perfectly tart and strong, while JI’s tequila shot came with a second shot glass filled with a savory, spicy tomato juice. 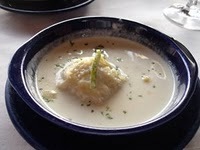 It was so delicious I would have drank it as a soup had it been served to me in a bowl. I also loved that the waiters would bring your glass to the table and then fill it up with the tequila of your choice. 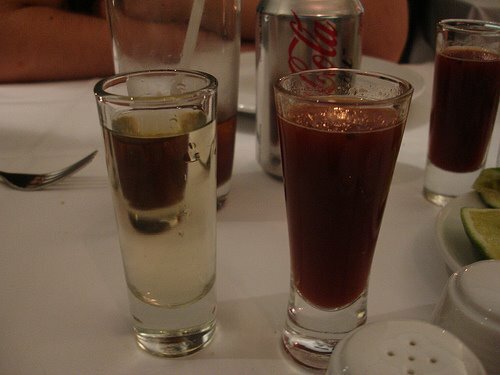 Ditto if you ordered a tequila and tonic- they would pour the tequila into your large glass until you said to stop, then top it off with the tonic. I’m not really sure if they would keep pouring if you just sat there until the tequila filled your glass but I imagine they would. 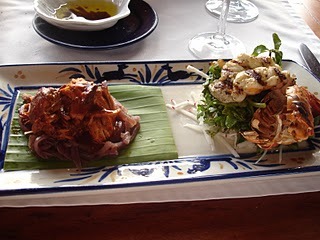 We had decided to share a couple of appetizers to whet our appetites. 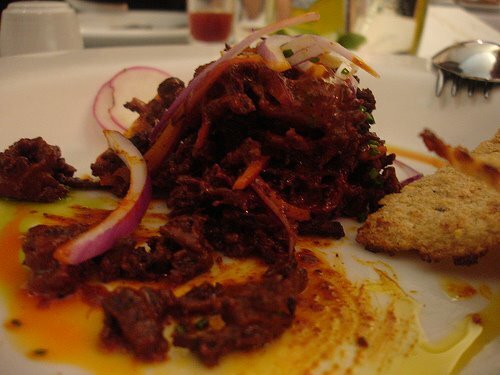 The shredded venison with achiote and picked onions was my favorite- it had a very chewy texture that was strange at first, then became addictive….each rope-like piece was so flavorful and, when rolled in warm, handmade corn tortillas, was pretty much all you needed with any cocktail. The four small tamales were also good but so tiny that it was really a challenge to split them all up between the four of us. 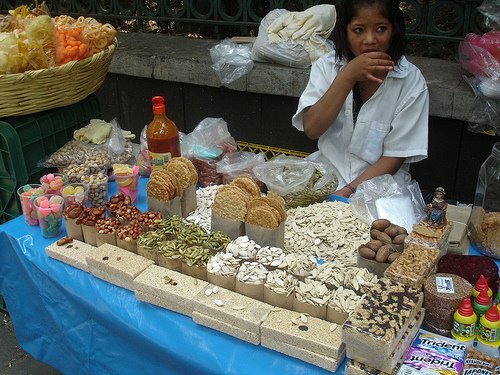 Since they were each a different flavor we wanted to try them all, and the one with huitlacoche (black corn mold) was definitely the winner. 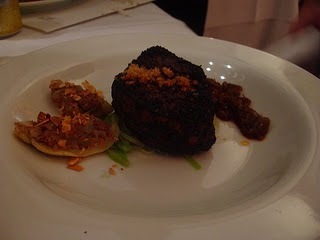 It was slightly pungent in the way a truffle is and added a nice contrast to the slightly sweet masa surrounding it. After those plates were cleared, our main courses arrived and so many different scents wafted through the air I could hardly wait to dig in. 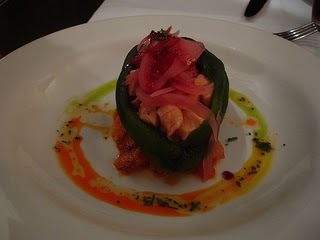 J had a beautiful fresh chile stuffed with sweet, tender chunks of salmon ceviche. It wasn’t tart like most ceviches but just slightly tangy and mellow- I definitely tasted pineapple juice in there somewhere- and was so perfectly cooked in the acid. JI’s chile and cinnamon rubbed steak was so flavorful and aromatic- it’s something I’d love to try at home- and we noticed that a lot of people had ordered it as well. 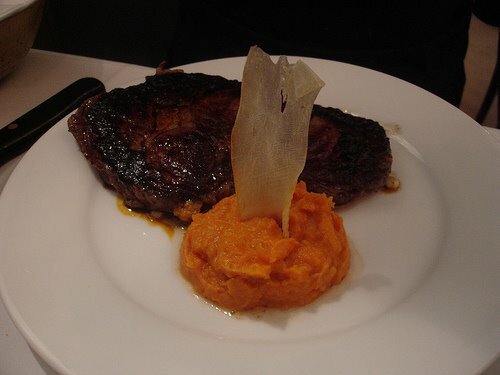 L ordered the rib eye with an apple and sweet potato puree which was less sweet than you may think and a wonderful match to his juicy steak. 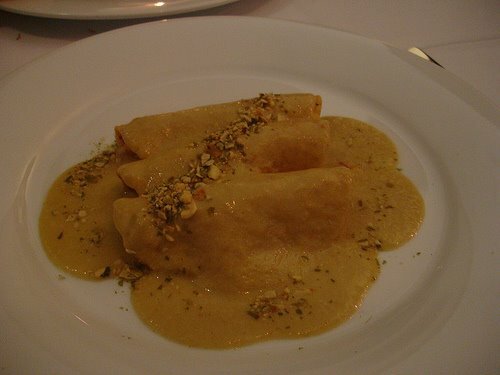 I went with the lobster enchiladas with pumpkinseed sauce which, quite honestly, was the best I’d ever had. The pumpkinseed sauce was sweet and creamy at first bite, but that sweetness slowly evolved into a mellow yet fiery heat in the back of my throat. It was so deep in flavor and, had I used a few pieces of bread to sop up the sauce after I’d eaten the enchiladas. Being vacation and all, we had to order dessert (of course) and the four we chose were all very impressive. J went with a trio of sorbets- the guava being the best one- which came with a Florentine made with pumpkin seeds. 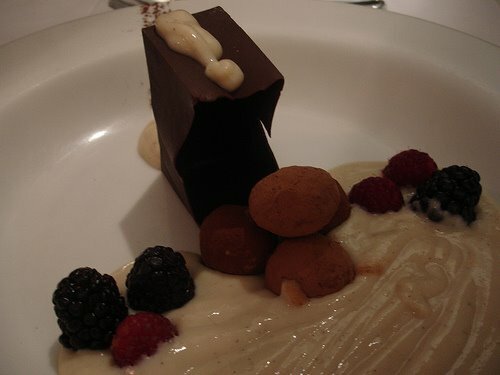 L had to go with the chocolate box with chocolate truffles, blackberries, raspberries, and a vanilla custard sauce which we all pretty much dug into once we saw the creamy custard literally spilling out of what looked like a paper bag made of chocolate. Talk about over the top! JI’s crepes filled with a hazelnut chocolate filling and a vanilla custard sauce were voted our favorite, and my crème brûlée of mamey (a melon that looks kind of like a mango and I saw everywhere at the Mercado) had a golden, crispy topping and hid a pile of warm berries at the bottom of the dish. I took a couple of bites and couldn’t eat anymore but the rest of the table ended up making a pretty big dent in it. We rolled ourselves out of Izote with full bellies and big smiles. I saw Patricia Quintana wandering around the dining room but was too shy to say anything to her. 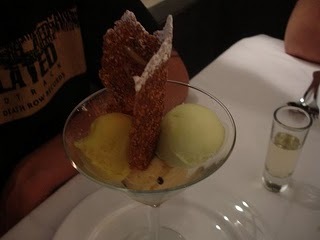 I think it’s cool that a female chef is making such an impact on the culinary world, and we certainly enjoyed her unique creations. 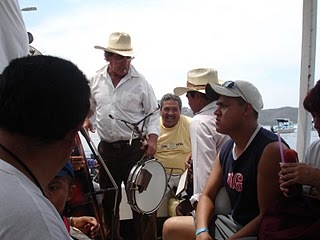 Here’s the last Mexico post- just a collection of a bunch of photos taken in Zihuatanejo. Looking at them now, it seems so long ago that we were there…..and we can’t wait to get back! If you’re ever looking for a quick getaway (from Los Angeles, at least!) it’s a short, 3 1/2 hour flight and United has nonstops from LAX. Although the flight doesn’t take long, you feel like you’re a world away. 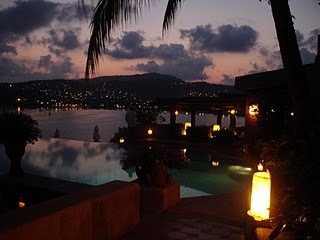 Here’s some of our favorite things about Zihuatanejo! 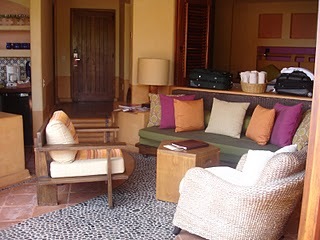 Club Intrawest Hotel- huge, gorgeous rooms, fantastic service, beautiful pools and beaches….highly recommended! 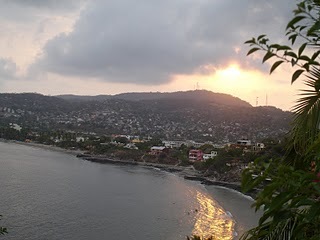 Ah…….Zihuatanejo. I can see why Andy wanted to end up there after escaping from Shawshank Prison and encouraged his friend Red to do the same. I’m so glad they did. First of all, it’s friggin gorgeous. Blue skies, blue water, green palm trees and wonderful people. What’s not to like? After three busy days in Mexico City, it was so nice to escape the hustle and bustle of such a big (and polluted- whoa. I’d never, EVER seen such a thick blanket of dark brown smog in my life than when our plane left Mexico City….eek) city. 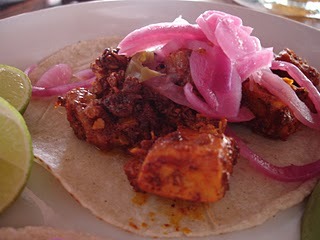 My second post will be a roundup of all the things we saw and ate, but I do have to devote one post to the best meal we had in Zihuatanejo. 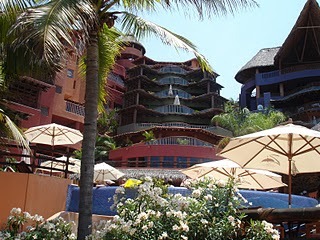 La Casa Que Canta is a world-renowned, world-class resort hotel and has been named one the world’s BEST hotels numerous times by various travel publications. 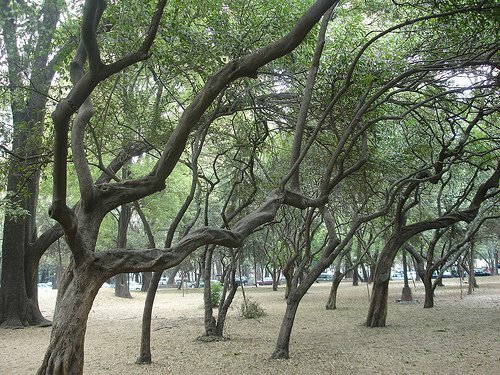 It was made even more famous by Andy Garcia and Meg Ryan’s little vacay in the movie When A Man Loves A Woman. While planning our trip, I toyed with the idea of staying there until I saw that three nights at La Casa cost as much as a brand new Maserati. Well, ok maybe not that much but you get the idea. 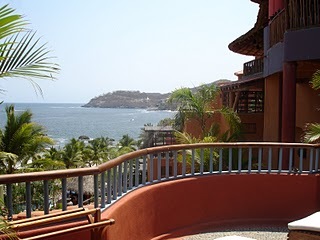 We ended up staying at the hotel right next door which was honestly just fantastic- we’ll be staying there during any future trips to Zihuatanejo (but more on that in the next post!). 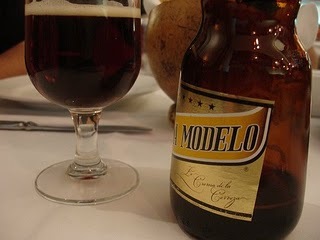 Anyway, since we didn’t stay at La Casa, we figured we’d just eat there. When we asked our concierge to make us a reservation, he mentioned that they have a strict dress code- no flip flops, no shorts, no t-shirts and “casual elegance.” Um, what? 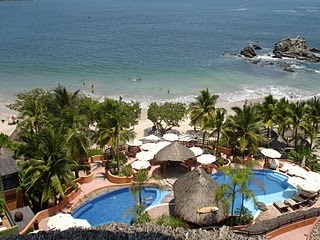 It’s Zihuatanejo, for cryin’ out loud! You have to wear SOCKS? We asked another hotel employee and he said the same thing, so we gave up. I mean, I had brought a couple of casual beach dresses I could dress up with some jewelry, but J had nothing but shorts and one pair of jeans, which were also apparently off limits. Oh well. We started the walk down the hill in search of a place to have dinner and was walking past La Casa when J said, “Let’s just go in and see what they say- maybe our hotel guys don’t want us to go to the competition!” So we walked in- he in the supposedly-offending shorts and t-shirt get-up, and I in some linen cargo pants and a white tank top. 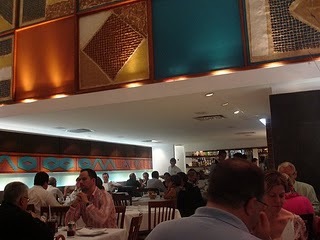 The minute we got inside of the beautiful restaurant, I knew we had to eat there. It was totally empty and the hostess definitely gave J the once over, but she was friendly and sat us immediately. YAY! Maybe because it was the off-season, maybe because J was right about our hotel guys, who knows. At least we were sitting on the edge of the gorgeous patio overlooking the ocean and their famous pool, holding menus in our hands. After a quick look, we both decided to get the four-course tasting menu, astonishingly priced at only around $44 per person. Look, I know it’s Mexico and a lot of things are cheap, but considering how much the rooms at La Casa cost, I was still surprised. 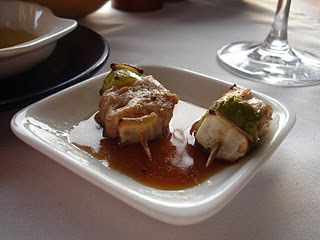 We ordered a bottle of pino grigio and nibbled on the amuse bouche of mini grilled fish skewers drizzled with teriyaki sauce. First up: a duo of appetizers. 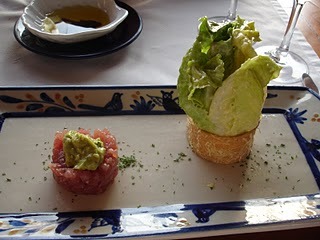 On the left side of the plate was some lovely tuna tartar topped with avocado, and on the left was an interesting take on a Cesar salad. 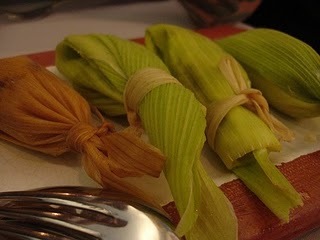 A parmesan cracker “ring” was filled with whole baby romaine heart spears, dressed with Cesar dressing. Both were fresh, light and very delicious and we were thrilled that we actually got two appetizers- this would be a continuing theme throughout the meal so it actually ended up being more like an 8 course menu! 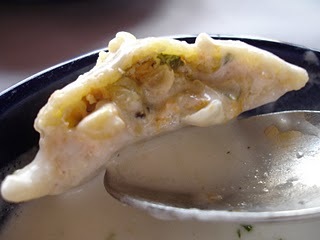 Next came a small blue tangine which contained a single zucchini blossom ravioli swimming in a light cheese sauce- YUM. This was probably our favorite dish of the night. I could have just picked up the bowl and drank the sauce, but I figured that might be rude so I resisted. It was perfect for dipping our bread in though, so we went to town. 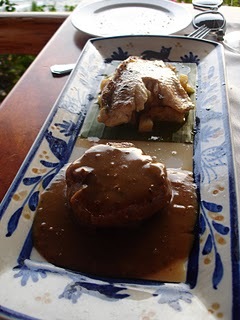 For our main courses, J chose the filet mignon with peppercorn sauce and marlin baked in a banana leaf. Both were cooked perfectly and the peppercorn sauce had a nice bite to it. I have to admit, it was nice to sink my teeth into some meat after living on seafood for the whole trip. 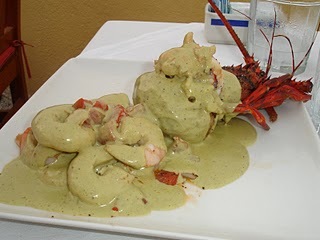 My main course of conchinita pibil on one side and grilled lobster tail on the other didn’t disappoint either- both were tender and succulent. 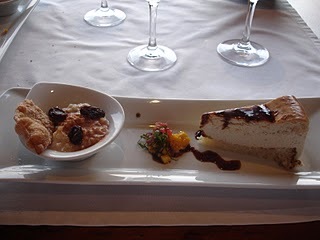 Dessert came in a pair as well- rice pudding topped with raisins and cinnamon and a banana cheesecake. The rice pudding was so refreshing- J hadn’t really had rice pudding before that and fell in love with their version. 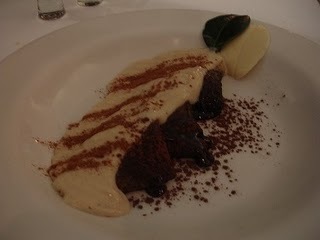 The cheesecake was rich but not too heavy and had a nice, distinctive banana flavor. 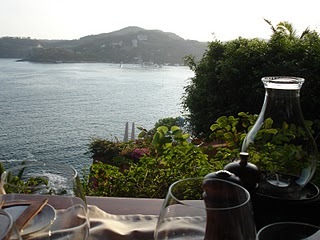 The food, service and amazing views make La Casa Que Canta a must-visit destination, but the value of the meal just cannot be beat! After we finished eating, the staff told us that we could go down to the bar area, sit by the pool and have a drink, which we did. I can see why the hotel is one of the world’s best and had to resist not sneaking into one of the bungalows to take a peek! The staff really made us feel at home, even if we weren’t guests there. 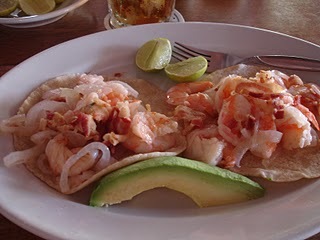 I highly recommend it for nice, sit-down meal to balance out all of the fish-taco eating you’ll do if you ever go to Zihuatanejo. 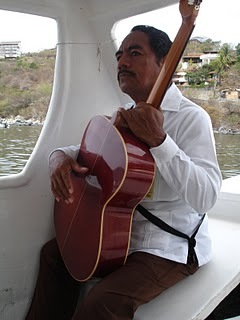 More Zihuatanejo photos to come!